Sunday: We drove the winding mountain roads to “Shadow of His Wings” Orphanage, a rural compound housing some 70 kids in Monjas, Guatemala. Shadow’s houses are grouped in a horseshoe each with 10 to 12 kids and house parents. The Shadow project has its own school and it is better than the local public school as proof by their large enrollment of town kids. Food at the orphanage is prepared in a central kitchen and 4 children from each house take turns hauling their meals back to their house. This is about a ¼ mile path that is under constant threat of being overgrown. 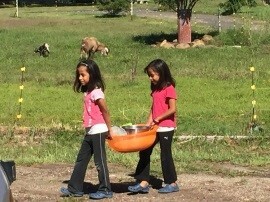 The kids carry their pots of food and deliver the empty containers back to the kitchen for the next meal. Imagine being 12 years old and your job is to carry a stock pot full of hot soup with a broken handle up a dirt path cut out of the weeds so your family can eat dinner. That is their reality and they are happy about it–heck they are happy and grateful about life. You can learn a lot from an orphan living behind a razor wire topped wall (The security is to keep them safe. Anything in central America of value is behind a wall topped with wire). After we arrived, we played basketball and soccer with the kids. I was beaten at H-O-R-S-E by two girls. Later that evening they led us in a worship service. These are some amazing kids who can sing and speak. Imagine being 15 yrs old and speaking to a bunch of adults (tall male white folks) through an interpreter (the pauses & everyone watching you while it is translated without a script). It was powerful stuff. I think she wrote her sermon for me. It turns out she has never done public speaking in front of adults, just to her peers at the orphanage. Game 5 of the world series, Go Royals! Some of us got to see it live! Through the kindness of a Missionary who had internet at their house we crowded into their home, dialed up the MLB network and presto we watched the game, God is good! Monday, a holiday? We would soon start our work. After discovering the wrong size PVC pipe was delivered for the system, “Shadow” staff, our partner, went about to find the correct diameter pipe required and hundreds of feet of it. But it would have to wait until Tuesday. Mind you we needed to be done by Thursday. Monday the “Day of the Dead” was being observed, so everything was closed. “Day of the Dead” has nothing to do with candy, everyone picnics in the graveyards to visit “past” relatives.